While holding your blinking infant in your arms, watching your toddler run toward music, or observing your five-year-old remember some tiny detail from last Christmas, did you ever wonder how the infinitely complex brain, five senses, and memory of these little ones develop? So did Lise Eliot, Ph.D., a neurobiologist and assistant professor at Chicago Medical School. Eliot, mother of three, could not find a book that sufficiently answered her questions, so she researched and wrote one herself. The result is a “must add to your bookshelf” reference for pre-pregnancy through age five or anyone interested in infant development. What’s Going On in There: How the Brain and Mind Develop in the first Five Years of Life, published in 1999, is thoroughly researched, well organized and indexed, and easy to read. Eliot explores the development of the five senses, language, emotions, memory, and cognition. Rather than just a treatise of scientific explanations on the development of these processes, Eliot focuses on what parents can do to raise a smarter child. What I love most about this book (beside, of course, the content) is the organization. When you have a thought such as “If we took our 5 month old with us to Hawaii, would he remember it?” or “What can I do to stimulate language development,” just look in the index and read the corresponding pages. Read as much or as little as you would like, but either way, in a very short time you will have your answer. 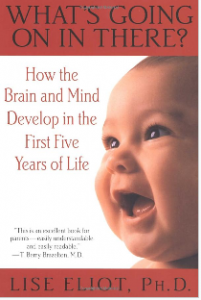 What’s Going On in There: How the Brain and Mind develop in the First Five Years of Life: by Lise Eliot, Ph.D., (New York: Bantam Books, 1999).